Chihuahuas have been a beloved breed for thousands of years – maybe even longer – yet the most common question new owners ask is how to train a chihuahua. The breed celebrates a rich history that isn’t perfectly clear to breed experts. One thing that can’t be denied, though, is that Chihuahuas are one of the most popular breeds in the world. As the world’s tiniest breed, they are perfectly pocket-sized and make for a fun companion, especially when you learn how to train a Chihuahua to do cute tricks! Their popularity has grown even more in the past 20 years thanks to so many celebrities who have made mini-me celebrities out of their cheeky Chihuahuas. However, if you’re considering getting a Chihuahua, it’s important to get a full picture of their training requirements to avoid dealing with some of the common complaints about the breed. There are plenty of Chihuahuas in competitive sports, shows, and in movies, showing that they absolutely can be trained to advanced levels. There are also many owners and trainers who struggle with basic behavioral problems with their dogs. These little dogs have a reputation among some for being feisty, snappy, difficult to potty train, and loud. So, which is the reality? Are Chihuahuas Hard to Train? The Chihuahua Club of America describes this breed as having a terrier-like temperament. Small terriers were originally bred to fearlessly dive into animal burrows while hunting, so having a “feisty” and combative personality is understandable. Chihuahuas are also very similar to terriers in that they have a big bark and are not afraid to use it. In fact, one of the most common questions from upset owners is how to train a Chihuahua to stop barking when they are home alone. Chihuahuas were not bred for hunting, though, but for companionship. Therefore, most expect the breed to be more loving and gentler lap-loving dogs. One side-effect of being bred as devoted companions, is a tendency for guarding and resource-guarding aggression. Curbing this behavior is the second most frequently asked question about chihuahua training. One study revealed that chihuahuas were in the top of aggression-prone breeds, being capable of attacking strangers and members of their own family. That’s why they aren’t recommended for households with small children. The third biggest question about how to train a chihuahua deals with potty training. Owners who have either bought a puppy that came from poor housing circumstances, or owners who have adopted older chihuahuas tend to have difficulty in this area. Once a chihuahua has established poor toilet training routines – urinating or defecating in the house or on their own bed, for example – it is quite difficult to re-train them to potty outside. That’s why we’re going into detail today on how to train your Chihuahua puppy right from the beginning. Our Chihuahua training tips will help you avoid some of these common frustrations with the breed. We are always proponents of positive training methods, and chihuahua training is no exception. Positive reinforcement uses rewards to encourage “good” behaviors. For example, if you want to teach your dog to sit, you reward her when she sits. The goal is for your dog to repeat behaviors that earn her rewards, like treats or affection. Rewards can include food, special treats, praise and petting, playing with a favorite toy, etc. Just be aware that since Chihuahuas are such small dogs, treats need to be especially small and used sparsely, so as to not cause obesity! So, as you embark on your Chihuahua training, we recommend learning the basics of positive reinforcement techniques, or hiring a local trainer who does. The first two components of your Chihuahua puppy training should be thorough socialization and potty training to avoid the top complaints of Chihuahua behavior. Socialization doesn’t just mean taking your puppy on play dates with other pups. Socialization actually refers to exposure to a wide range of situations and individuals. 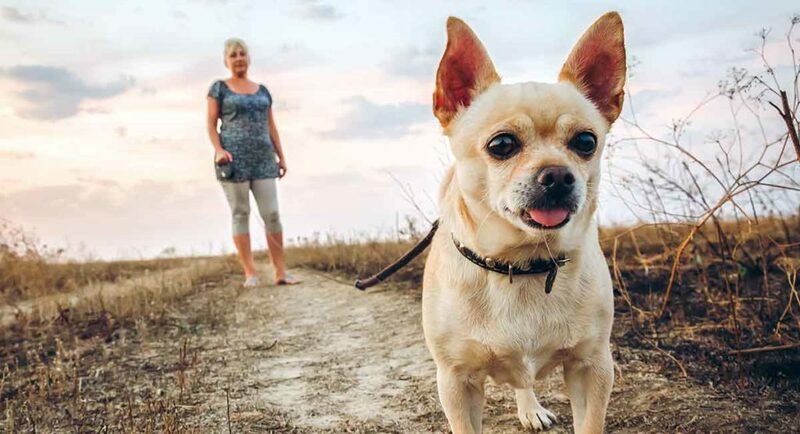 For such tiny pooches, it’s important for your Chihuahua to be regularly introduced to larger dogs that are very gentle so as to make a lasting impression on your pup that big doesn’t mean scary. This goes for being around lots of different people, including children. While your pup is still impressionable and inquisitive, introduce her to friends, neighbors, and strangers. Introduce her to children with careful instruction to stay quiet, move slowly, and pet gently. Children have a natural inability to regulate their grip until they are 7 years old, so don’t allow small children to hold your puppy or they could end up grabbing her tightly and scaring or hurting her. Being handled by other people is key in socializing your puppy. Your dog should be properly socialized to gentle and careful handling, teeth brushing, touching ears and paws and tail. This will make trips to the vet and groomer much easier. Plus, since these dogs are so small even as adults, it’s likely they will be carried around and passed from person to person. It’s very important your pup doesn’t fear being handled, or she could end up biting someone’s face. The first of our Chihuahua training tips is to make proper toilet training a priority. Try to avoid starting out with pee pads that claim to help with potty training puppies and difficult dogs. Most Chihuahua owners say that once they’ve started using pee pads, they can’t manage to train them off of them and into a normal outdoor toilet routine. If you’re not comfortable having smelly, urine-soaked pads around your home and bringing them with you anytime you travel, I don’t recommend using them. Instead, start establishing a daily routine right away. Mama’s home from work/school – you guessed it – POTTY BREAK! The first few days with your new pup, set a timer to take puppy out to the designated potty spot every 2 hours, and reward any relief in the right spot with praise and play. People often over-estimate these tiny pups’ abilities to “hold it” for extended periods of time. Your puppy’s bladder and abdominal muscles will strengthen to “hold it” longer and longer over the first 6-8 months. Most people rush the process, which is a mistake for tiny breeds. Additionally, always offer a potty break after your pup wakes up (even from a short nap), eats, drinks, or has a heavy bout of playtime. These activities typically trigger an urge to go potty. By 10-12 weeks, with a good routine it’s reasonable to think your puppy can “hold it” for about 3-4 hours during the day or 5-6 hours overnight. Yes, that means if you work a typical 8-10 hour shift, you’ll need to come home or have a pet sitter pop by around lunchtime for a potty break. It also means your pup will probably still be whining around 2-3am for a potty break too. Some adult Chihuahuas will never physically be able to “hold it” longer than 6 hours. So if you work a traditional 8+ hour shift outside of the home, you’ll need to make plans for a dog walker or to bring your dog to work with you. Once you’ve established a solid foundation for home life, you can move on to other Chihuahua puppy training concepts. Even if your dog is only 5lbs, it’s important to teach him not to jump on people. You can use our training guide for stopping jumping here. To train your chihuahua to be comfortable being home alone so they don’t bark all day, you should consider crate training. Learning how to train a chihuahua puppy to be comfortable in their crate will reduce their chances of barking due to separation anxiety. A crate will provide a comfortable resting place for your pup while you’re gone. For a detailed guide to crate training a puppy, use this guide. Most puppies will go through a play biting phase, so if you need help training your playful chihuahua not to nip, you can follow this guide. However, if your Chihuahua growls when you or someone else tries to handle her or bites and snaps at you if you approach while she is eating or playing with a toy, then you need to intervene. I recommend hiring a licensed canine behaviorist or a dog trainer that is experienced with canine aggression. Many owners of toy breeds are dismissive of aggression. People often think a small dog cannot do much damage. The reality is that small dogs are most often held near a person’s face, which makes for more dangerous bites. They also can instigate a fight with a larger dog, which will have tragic outcomes for your tiny dog. Learning how to walk politely on a leash in public is important. Since your Chihuahua is small, people are dismissive of the need to train them to walk politely on a leash. A detailed guide to leash training can be found here. One of our specific Chihuahua training methods to walk politely on a leash is to put them on a table or bench and practice walking alongside them. Take precautions for their safety. Using a target at the end of a stick will also help you train her to stay by your side without back-breaking training sessions. Also, shuffle your feet quietly and smoothly to make as little motion and noise as possible so as to not scare them. It can be a lot of fun to teach your miniature companion tricks! You can see chihuahuas on TV and in movies doing some great examples. There are also a lot of Chihuahuas in “freestyle” competitions that do choreographed dance routines. If you’re interested in learning to teach your dog tricks, I recommend learning about clicker training , shaping, behavior capturing, target training, and behavior chains. Each of these range from beginner to advanced training techniques that are used on animals of all sizes and species. Do you have any chihuahua training tips to share? Let us know in the comments below! Deborah L. Duffy, Yuying Hsu, James A. Serpell, Breed differences in canine aggression, Applied Animal Behavior Science, 2008. Disagree with the comments about P Pads. For anyone that works, they are a godsend. If you can’t come home during the day to let them out, expect accidents. No more getting up at night to take the dog out. No more going out in thunderstorms or blizzards. If you live in an area that has predators like coyotes or hawks…well, you get it. Finally, these pads can be picked up often and are much less smelly than a litter box. I recommend them, especially for the small dogs.